Background: in the 1950s a group of vine growers from different settlements of our regions decided to associate in order to sell together the products obtained as a result of processing of grapes gathered in the vineyards. In the 1990s the association worked to improve the production process and to deliver the products obtained to the global markets, and for that purpose BACO, 2nd degree cooperative, was founded. 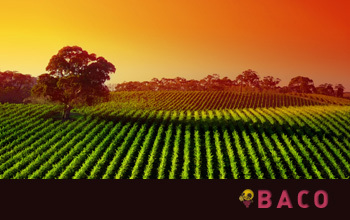 The BACO cooperative is based in La Mancha and is considered to be the longest and the biggest vineyard in the world; it is located at an altitude of 700 and 750 meters, in an arid area with cold winters and hot summers, with high day temperatures and cool nights. Such climate is perfect for vine-growing. The vineyards are owned by 8,500 members of the cooperative and occupy 35,000 hectares spread all over La Mancha; at that, the production volume amounts to 150,000,000 million liters, due to which our cooperative is one of the major producer of grapes in the region. We grow various sorts of grape: local sorts – Airén, Tempranillo and Bobal, as well as imported ones – Cabernet, Shyrac, Merlot, Sauvignon Blanc, etc.